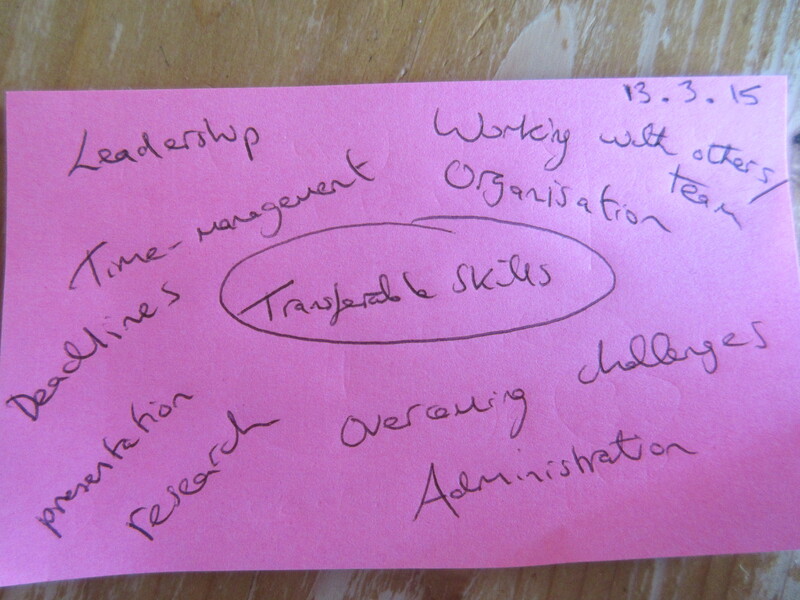 Think about how I might rank transferable skills and reflect here on those choices. Also, in devising my own ranked list, this facilitates data comparison with Survey Monkey participant data generated, as well as data derived from National Careers Service. This then allows me to identify crossover and divergent factors at play with the emergent key words used from all three sources – serving to justify transferable skills to incorporate for the planned paper-based prototype. Ask all participants (in a second cycle) a revised version of the initial question and in doing so, specifically target and incorporate the 50% of participants who opted for a non-key word/ mind-map approach as their method of choice. Returning to the previous week’s data also facilitated further triangulation of data accrued in the first cycle. This enables me to extract (arguably much needed additional) data in order to formulate an overall top ten list comprising of all ten participants and not just the 50% of participants who produced clearer more tangible data, as initial analyses indicated. Consequently, this strategy initiates the process of formulating and constructing a transferable skills tracking tool aka Phase Two – Prototype testing of a Personalised Digital Transferable Skills (or PDTS) instrument build around crowdsourced data. The paper-based prototype is formulated as an aggregate of all participants, not just the 50% I was able to make sense of in cycle 1. Working with Others is ranked first because pedagogic activities are people-centred in terms of relationships with students and with management structures at play. Although I haven’t stated negotiation as a key term, negotiation is very much part of working with others for me as I am split between the pressure to view students as customers against the realities of the social care now at the forefront of my remit. As forces of oppression collide, this project is in fact a form of liberation for me as I am all too aware how I am part of the oppressive education system within which I struggle. Time-management is ranked second because time itself (the amount of actual timetabled time for the curriculum and with students is becoming an ever more repressive factor in how I do things and on’t do things) and how I manage or try to manage delivery of curriculum in a balanced and fair way becomes more stretched. Time itself has become an oppressive factor. The absence of time makes it an ever present issue. Organisation, once a perceived strength is becoming a challenge due to the erosion of time as referred to above and therefore could equally be ranked 2nd. Administration ranked 4th links into the course leadership duties of managing a course and the endless and often repetitive online systems we are now duty-bound to keep updated. Also pertinent, is the fact that our ability to administrate is deemed equal if not more important that our ability to teach, engage and develop classroom thinking. Therefore administration could be ranked 1st. Overcoming challenges is ranked 5th but in reality overcoming challenges are part of every day practices and therefore could be ranked 1st. I have ranked Leadership 6th because it is a term I associate with the senior management team. Leadership in my setting usually comes in the form of a succession of emails requesting that I need to do x by y pm. I am undertaking leadership duties constantly although it is not acknowledged, therefore it too could be ranked 1st. Research is required to design project briefs and compile relevant reading materials for pedagogic purposes and know my student data for course review meetings/ purposes, although the erosion of time has arguably impacted negatively on the former in terms of quality and depth. The latter, less so, as statistics are easier and quicker to access/ extrapolate via systems such as ProMonitor. I have ranked presentation 8th as pedagogy involves presenting materials in various formats on a daily basis to different cohort groups across time. Although presenting to students is required daily I could also rank this as 1st yet I chose not to as I have come to view my role as facilitator over the past few years over and above a presenter of knowledge. As I have reflected here, the transferable key words/ terms identified are in fact very difficult to rank with any effective judgement as each term is closely connected with different facets of my role. Therefore a clear and coherent understanding of what each term might mean within and across contexts makes the process of ranking almost impossible for me. This exercise made me think about how and why the participants may have ranked the 16 options available to them in the questionnaire and how considered they actually were during the ranking exercise. My understanding of each transferable skill identified above is unique to my current role in Further Education and therefore arguably problematic precisely because they link back to my biography, history and experiences of the professional world – at that one moment. Transferable skills change with context, experience, age and indeed with reflection. Conducting this exercise serves to reinforce the fact that transferable skills are conversely rooted in the personal and far from generic in meaning. For me, the experience of undertaking this pilot project highlights that transferable skills are a personal thing and need to be treated as such. I have been fooled by the term itself and maybe this is why there seems to be such a lack of understanding from a pedagogic grassroots perspective. To reiterate and as an example, the generic ‘transferable skill’ identified as working with others appears a generic entity but in reality working with others can only be evidenced when identified and appropriated within a given context by an individual and the student biography and their consciousness of this ensue of biography is critical to their successful reference and implementation. Although the first cycle of self-selected methods failed to give me the data I was looking for, it has illuminated an aspect of this project I was not fully prepared for… just how personalised transferable skills are. The tool (be it paper-based or digital) I create as an outcome of this research has to be a personalised tool and there is nothing universal about that.